When our family started our homeschooling journey it was because of the needs of my oldest child. In no way was I prepared or equipped to handle teaching my son who was diagnosed with Asperger Syndrome only the month prior, nor did I fully understand how severe his depression was, but I knew in my heart keeping him home to learn would keep my son from slipping any further away from me than he already had in his 8 months while attending private school. This journey started 17 years ago for our family and through it, our entire family has dramatically changed. I would say for the better. Homeschooling is a hard road, but homeschooling a child with extra learning, emotional, social, and behavioral needs is also often an isolating and lonely journey. Some families are able to push through this isolation and build a small support community, but for others, the needs of their child(ren) create barriers too large to overcome on their own. As I described in the video above, our family created our own support and many families can create their own tribe if they dedicate a good amount of time and energy to the task. But for families who homeschool children with a more complicated diagnosis or family dynamics, the solution for finding time to rest and opportunities to do activities and develop relationships are not as simple as pulling a few families together to create community. Instead, these families must rely on someone else to do the support legwork for them. Otherwise, they just continue the journey alone as best they can. I would like to introduce you two homeschooling families who have been part of SPED Homeschool since we launched our nonprofit in 2017. SPED Homeschool board member Elaine Carmichael and SPED Homeschool team member Shanel Tarrant-Simone. Both of these hard-working homeschooling parents are mothers of boys on the more complicated end of the autism spectrum. Elaine shares her story here about how after homeschooling her typical children for many years in a loving and nurturing co-op, her support system crumbled as her youngest son’s needs grew greater. Further on in this same interview, Elaine also shared that even though her son just turned 18 this past year, there really is no place for her family to turn for the respite and help; respite she and her husband need and buddy opportunities so her son can have experiences similar to other kids and young adults his age. Q: How difficult is going out in public with Aaron? What roadblocks are a constant hindrance? Q: In what ways does bringing Aaron out in public without help hinder your family’s ability to integrate into society? Q: How could having a consistent, trained, and caring buddy/helper for Aaron improve your family’s ability to participate in your community? Q: Why did you choose to homeschool despite knowing the school could have helped provide some respite or buddy opportunities for you and Aaron? Q: What else would you share with families/individuals about the advantages of homeschooling Aaron? In the same way, but with even greater demands upon her time and resources, SPED Homeschool team member Shanel has raised and homeschooled her nonverbal autistic twin sons as a single mother. Shanel deals with similar issues as Elaine in caring for her boys who also just recently turned 18, but an added stress to her life is the sad truth that as a single-parent she often walks this road almost completely alone. 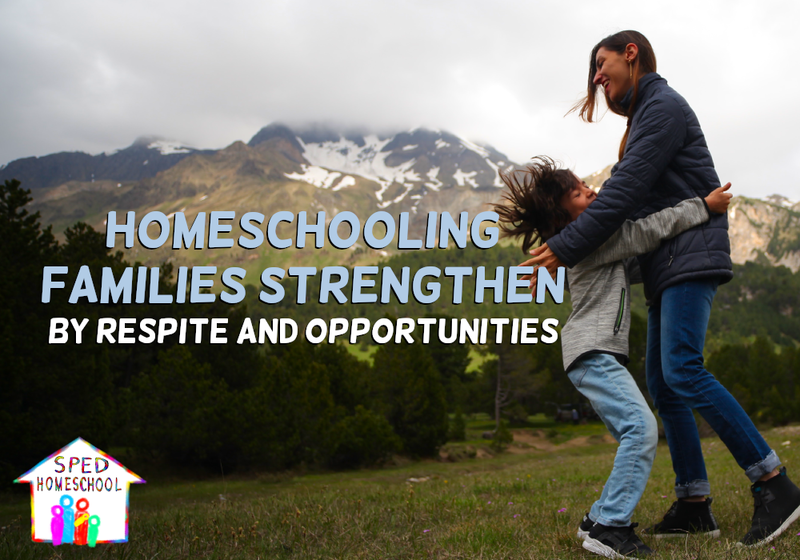 SPED Homeschool understands a special needs homeschooling family’s need for respite and opportunities intimately because we have experienced those same needs within most of our own family’s homeschooling journeys. It breaks our hearts every time we have a new member join our Facebook support group asking for help in connecting them to local resources and not having anywhere to send them. But we are not satisfied with providing just an online support for these families we have a heart to serve. We instead want to meet their greater needs and develop local support groups in communities throughout the United States through a program we are calling SPED Strong Tribes. These tribes will focus on filling 5 basic needs: togetherness, respite, opportunities, networking, and growth. Each of these components are being covered in blogs this week before our campaign to increase awareness of the essential nature of each in supporting special needs homeschooling families. To learn more about the SPED Strong Tribes campaign and how you can help build stronger special education homeschooling families by partnering with us in this campaign, click here. We have also created this simple video to explain the whole program. Thank you for sharing this information and partnering with us to help our isolated families get the respite and opportunities they so greatly desire and need.